"My First Travel Book" by Anna Othitis offers a wonderful way to teach young children about famous and beautiful places of our world.A short illustrated page on several cities and sights in Africa, Europe and the US explains the significance of the places and then asks questions so you can see if the children still remember.It's a great way to learn, Othitis has carefully composed the pages to make them fun and entertaining as well as educational.It is books like these that made me decide to make travel my profession, which is was for 15 years. Othitis brought back my excitement of those days and I am sure she will have the same effect on her readers, young and old.The production values of the e-book are amazing. What's with so many 5-star ratings? I think those readers must have read the Bulgarian translation which I heard was fantastic. I continue however to be mystified by these self-published books on Goodreads which get such super high ratings! It's like I, and these other reviewers, are not-reading the same book! This lovely children's book is fun educational and an easy read, with poetry, rhyming and made fun with easy explanations and information, followed by questions at the end of every page. The illustrations are very real and feels that the children are by the actual sites. a lovely read where parent can child bond and read together, parents will also learn as they read to their children. Fun and informative.This is the reason these particular destinations were chosen at the time of writing my book:- This very bright, crispy, morning while sitting on our back yard balcony in the warm lovely sun shining day drinking my Greek coffee, with the birds happily singing and chirping in the back round, my thoughts took me back to the time that I started writing our children's book " My First Travel Book " what was it in my heart at that particular moment to choose these lovely destinations that Captain Frankie flies to.Our beautiful loved home we lived and grew up in, Zimbabwe with her mighty, thunderous water of wonder ' Victoria Falls 'Our land Africa where we grew up in with its wonderful wild animals and life, its stillness of natural beauty, its primitive people.My country of birth and culture Greece with its ancient land mark of the ' Acropolis 'Our now country of residence USA, the country of freedom, where the opportunity for Captain Fankie was given to take up the love of his life and career, aeronautics/pilot with her amazingly huge land mark ' The Statue of Liberty 'The land of Canada where our two sons were given their opportunities to reside in with the mighty curtain of water so very powerful ' The Niagara Falls '.The ' Eiffel Tower ' where the beginning of our two sons Canadian future paths began.This is the "beautiful bright sun shining light" that suddenly shone in my heart on this wonderful morning that took me back to think of that particular moment of our angelic flights and choices of destinations in our children's book with Captain Frankie. THERE IS ALWAYS A STORY TO BE TOLD BEHIND EVERY CREATION IN LIFE.Let us take a deep look into the bottom of our happy hearts our inner selves and know that we all have HAPPY, wonderful, thankful, mysterious, worthwhile stories to tell our family, friends, the world , to all of our children in our world, always with such happy endings, always seeking more and more happy, fun adventures to travel to in our beautiful world. My First Travel Book by Anna Othitis is an inspirational travel guide for children. Every parent should teach their children with this book full of wonderful images, lyrical writing and questions to keep your kids on their toes and actually learn about the world.So what are you waiting for, come join the adventures of Captain Frankie and the Angelic Airlines flying angel as they travel across the world to some of the most popular, entertaining, and educational places in the world. Captain Frankie is waiting for you to book your ticket, safely stow your bags, and open your eyes to the beautiful places created for all of us to visit in My First Travel Book.I love this book and am hooked on the author's easy-going style. Very highly recommended. I bought this book for my daughter after reading so many positive reviews on this site. I was surprised to receive a book in the mail that appears to be a self-published work in dire need of an editor (or at least a proof reader). It is certainly a nice idea--a non-fiction children's book about a few landmarks around the world--but this is not the book to choose if that is what you are looking for. Travel the world with Captain Frankie (for children aged c.5-7 years)4.5*This slim volume caught my eye, aimed I imagine at 5-7 year olds and is designed to inspire a wonder of some of the world’s fantastic sights.You are welcomed on board Angelic Airlines and looked after by Captain Frankie as he flies his plane to seven extraordinary wonders, both natural and man-made. There are several fun and interesting facts for each place visited and the flag of the applicable countries are illustrated.This book is just made for every budding Andy or Dora the Explorer and might well sow the seeds for a bit of wanderlust in later years.My slight quibble is the quality of the book. It is an overly soft, malleable product – reminiscent of an exercise book – with an easily-creased cover. It will inevitably be putty in the hands of smaller children and will therefore probably not last the journey! After reading/reviewing a slew of adult books I felt the need to start reading/reviewing books intended for the inner child in me; books which would allow my inner child’s imagination to blossom and flourish, while at the same time educate my mind with interesting new places and facts.After perusing Amazon for children’s books I found three books written by Anna Othitis which would satisfy my desire to be a child again, reading a book intended for me.Being a child of the 1950’s when I wanted to play with my friends; besides playing all the regular games we loved to play, we would ultimately wind up playing pretend or make believe sometimes for hours.In “My First Travel Book” not only did I get, or any reader will get, is to pretend we’re on a plane with Captain Frankie who will take us to several places around the world so we can learn about them. The book begins with showing the flags of the various places its readers will be taken to. Arriving at each of the planned destinations readers will be given a poetic description of the place/site, followed by information about is being seen. And to make sure everyone reading the book understands what they’ve been taught, Captain Frankie then asks questions about it.I, as I’ve already said, found this book to have a twofold purpose; to turn on a child’s imagination while at the same teaching them something in an enjoyable manner so their minds will remember it. For having done this so imaginatively, I’m giving Ms. Othitis 5 STARS.I read this book via a KINDLE Unlimited download. The wonderful little book MY FIRST TRAVEL BOOK: ANGELIC AIRLINE ADVENTURES is one children from the ages of 4 or 5 all the way to 11 or 12 years old will have fun reading (or hearing it read). The little ones will enjoy the illustrations and poetic text and the older ones will really learn so much about all the great destinations in MY FIRST TRAVEL BOOK: ANGELIC AIRLINE ADVENTURES by Anna Othitis! And it'll have an international appeal!Anna gives such informative information, and I can't believe she rhymes it, too! And the questions will get the little ones thinking about their adventures around the world in a 'learning' sense. It's great for children about to travel and for those who don't get to really go. Even I learned a few things reading it to my grandson! Definitely made me hanker to go to the places I've only heard about. The author has been blessed to travel the world over and is so sweet to share her travels in this way. Anna is a darling of children's writing. A little fun-filled poetic booklet to keep them amused on a rainy day! Questions and answers are not only educational but entertaining. An armchair tour of several capital cities will also increase their general knowledge. It's a work of love with colourful eye-catching illustrations. I hope the author will do several sequels - a 'safari' perhaps with questions and answers of wildlife and its habitat around the world. I wish learning could have been such fun in my day. My First Travel Book is a cute introduction to some of the world's most recognizable attractions. Simple illustrations allow children to easily identify each landmark and the rhyming section of each page makes for a great read-aloud. Brief questions after each location allow the adult to quickly assess the child's listening or reading comprehension. They can also be used for a child to do a self-assessment. Diverse landmarks were included but there were certainly some that I thought of that could easily be included in a companion book! Note: This book was won on a giveaway featured on goodreads. All thoughts on the book are my own.This is a cute educational book on different world attractions and landmarks. It would be a great gift for a preschooler who is going on a first trip by plane. It also comes with instructions on how to view it an an audio book. I did not do this, but it would be a great option to put on a tablet for reading while traveling. (Received through Goodreads First Reads)A cute little fun and educational children's book. I even learned something reading through it :-)It has rhyming, interesting tidbits, and questions at the end of each section to entertain as well as inform. It'll keep their attention and the questions make them concentrate. The book even comes with an audiobook download that you can load on whatever device you listen on. Such a cute series!! !Very educational and fun! I was able to read it to my seven year old daughter, and she loved it!She was engaged the whole time, and enjoyed the pictures. I did like the feature of the review questions at the end of every destination. It helps children remember what they had read, or had listened to.I'm excited to read more books from Anna Othitis to my children! So much fun! This book introduces the young reader to several landmark sites around the world. There are fun rhymes and the book is written as if the reader is taking a trip with the airline pilot. Very fun and entertaining. There are also questions as the end of each site so the child can test his/her comprehension. Highly recommended! My First Travel Book is an educational fun and inspirational book teaching and showing young children these amazing famous and beautiful places of our world with such lovely illustrations.On several cities and sights in Africa, Europe and the US the book explains and gives interesting information followed by fun questions for both children and adults to interact with one another. An amazing way to learn about the world over the oceans so far yet so near and from the comfort of ones own home. Anna used careful selection in her story pages to make them fun and entertaining.It is books like these that children learn famous site seeing sites getting the children excited to prepare to one day visit these fun landmarks situated in all corners of our wonderful earth. Maybe one day deciding to travel abroad with the pictures still in their minds. Captain Frankie brings excitement to his readers, young and old as he flies the children in the wonderful clear blue skies. Simple with some rhyming to keep the children interested and use their imagination. All the illustrations are colorful and authentic as seen in realty. I thought I knew everything and so did my son. That is until we read this book! Filled with interesting places and educational facts, we got to learn more about places we had visited. We also learnt about places we had never been to before. Now we want to visit those places desperately! What made this book even more special was the poems, quizzes and the beautiful illustrations. Together with the facts, poems, quizzes and the friendly pilot, this is a highly educational and entertaining read! This is the perfect children's book for bedtime with a kid that LOVES to procrastinate going to sleep. It took us less than 5 minutes to read and it was mentally stimulating enough to make him sleepy. But more than that! This little book inspires our little dreamers to one day travel the world. If enough kids read, and open their minds and hearts to new cultures and experiences, perhaps they will have a better chance of making this world a peaceful and better place. Maybe they will look after our beautiful world better than we ever could. Perhaps our future generations will succeed where we have failed. 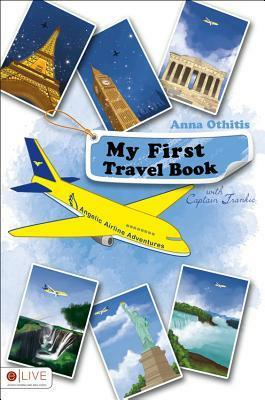 Anna Othitis' book, "My First Travel Books 1) is a great choice for children, informative and well executed. What a good idea. Short, easy to read pages on cities and sights in Africa, Europe and the US tell kids about different places, and even include some short questions. This book will broaden kids' understanding of the world around them.A superb choice for children whose parents travel or who are planning to take their children on travel.their own home.The writing is simple and clear, the pages well arranged so that the book is entertaining. Colorful illustrations depict real places that a child might visit. Disclosure: I received this as a sweepstakes winner.A lovely book for children that will make them want to pack their suitcase and take a trip. My family was just discussing where we would like to go for vacation and after reading the book the kids decided Athens. Any book that gets my kids excited about travel gets my vote!While I liked the book, I do wish the pages were actual pictures of the places instead of drawings. This is probably just personal preference. The author really hit home with this one, I feel. The message is one of exploration, adventure and learning. In reading this book, I noticed many new thoughts and ideas arise in my two young children. The way the author uses her words as well as incorporates pictures allow the children to run free with the story and it's truly a great way to encourage their imagination. My kids loved it, I'm sure yours will too! Love this series of travel books for kids. Educational and fun, full of great illustrations, it offers a guidance for traveling beautiful places, as we follow Captain Frankie in his adventures. The historical questions in the end of each section are another great way to learn and enjoy. I highly recommend! Full of colour, interesting information and even a bit of poetry, "My First Travel Book" is a great read for young kids. Covering several important sites around the globe, the book is well written for early readers or for younger kids to listen to someone read it for them. The drawings were simple but sweet.I was given a copy of this book by the author in exchange for an honest review. A highly original series that combines travel books, children's books, and education. Of course, these places are better in real life, but if you can't afford the ticket, these books are definitely the next best thing. A wonderful book that will teach your kids to international landmark around the world. There is also questions at the ends of each trip, kind of comprehensive listening for my kids and flags for each country. It's a great book to open your kids mind about travels abroad.Love the book! Great job! Anna Othitis - I lived and was raised in the beautiful land and country of Zimbabwe, Africa (home will always be home), we relocated to Wanaque, New Jersey, USA, our new home where our younger son Frankie took up his “American Dream”. My favorite saying “Be Bold Be Brave”. My dream is to be given the opportunity for my book to reach each and every less fortunate child who will have the opportunity to fantasy travels through our book to see our lovely world destinations and to one day to give back and assist the needy in Africa and beyond, to keep giving care and love to the less fortunate. Whilst in Zimbabwe I was involved with many charitable organizations and groups where my greatest passion and love was with the primitive, simple people of Zimbabwe, Africa and will still continue to reach out to the many beautiful children of the world.